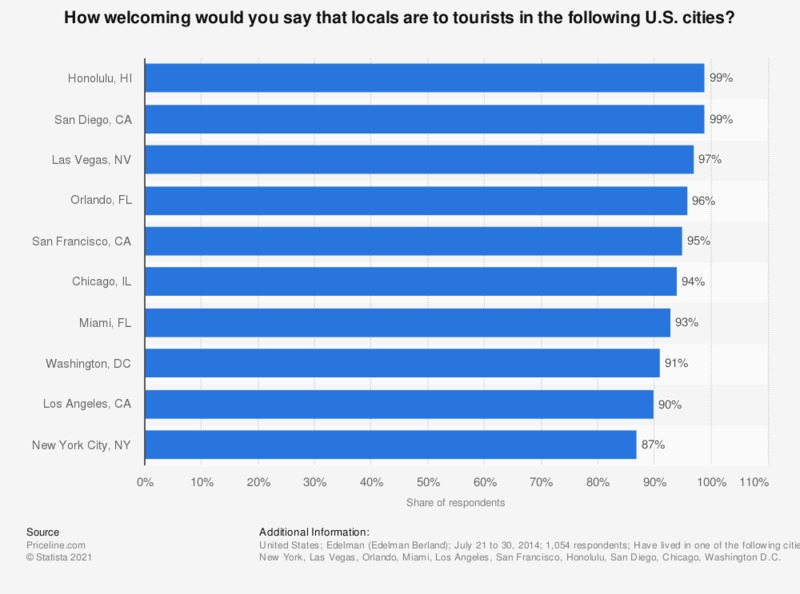 This statistic shows the most welcoming out of popular tourist cities in the United States as of July 2014. During the survey, 97 percent of locals from Las Vegas said that they thought the locals in their city were welcoming to tourists. Have lived in one of the following cities for a minimum of five years: New York, Las Vegas, Orlando, Miami, Los Angeles, San Francisco, Honolulu, San Diego, Chicago, Washington D.C.
* Out of popular tourist cities: New York, Las Vegas, Orlando, Miami, Los Angeles, San Francisco, Honolulu, San Diego, Chicago, Washington D.C.